Society business may be conducted under this Category of posts. You may leave the Visibility set to Public if it is information that you don’t mind sharing with the entire world. If it is information that should only be seen by other Society Officers, please set Visibility to “Password protected” and set the Executive Board’s shared password on the post. Welcome to the new DCGS web site and blog. The society officers hope to be able to keep you more informed with the new, interactive format. We will be adding more specialized forums for research and announcements; the Blog will be our place to discuss society-specific topics. Newsletters will remain hosted on our RootsWeb site, but are all linked from program year pages on this one. 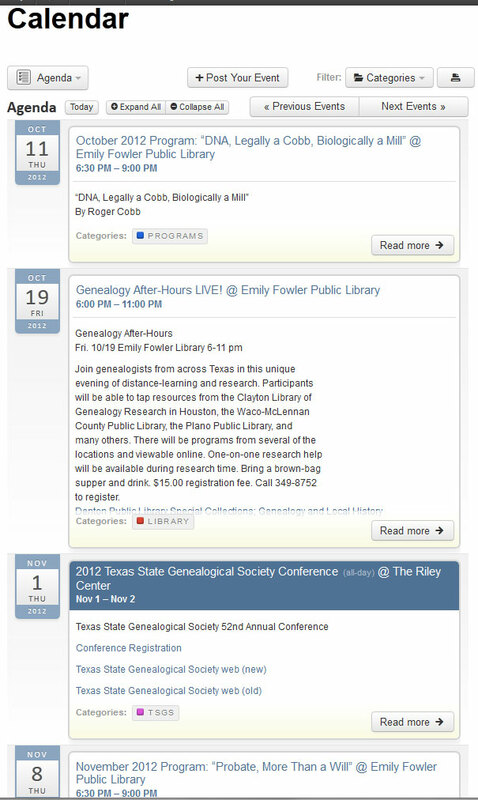 Be sure to take a look at the new calendar in the Agenda view, as shown to the right; it provides an excellent, detailed list of all upcoming genealogy and local history events.